I just wanted to give you guys the heads up that my next post may not have happy news, and it also may mean a time gap in posting. We took Natasha to the vet today, and we did not get a positive report. They did x-rays, which showed that her heart is enlarged, and also that she has a large mass near her spleen. The vet is sending the x-rays to have them assessed by the radiologist to confirm what he thinks is going on, but he told us that we should be prepared that the outcome is something that we're not going to be able to fix. He is supposed to call me tomorrow with the test results. To say that I am heart broken and devastated is an understatement. Natasha is my baby, my little court jester, and the ultimate underdog. To think that we may only have a matter of hours or days left with her makes me want to punch a hole in the wall. I suppose there is still a chance that the x-rays are not as severe as the vet originally thought, but unfortunately I have been through this situation before. 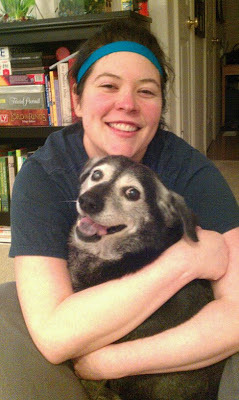 When you've loved a dog and had them for their entire life, 14 years to be exact, you know when they are not well. I hope to have an update for ya'll one way or another tomorrow. Just wanted to leave off with this picture for now. We both look so happy in it, and I've been so blessed and happy to have her in my life, no matter what happens.